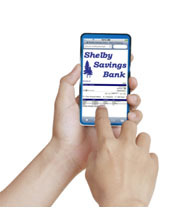 With Shelby Savings Bank's Mobile Banking, all your accounts are in the palm of your hand. Our Mobile Banking service lets you complete banking transactions through a web-enabled phone or mobile device. Access your accounts, transfer funds, pay bills, make loan payments and view previous transactions, all with a few taps. Shelby Savings Bank’s Mobile Banking service utilizes the latest security features, so you can bank with confidence, wherever you are and whenever you want.